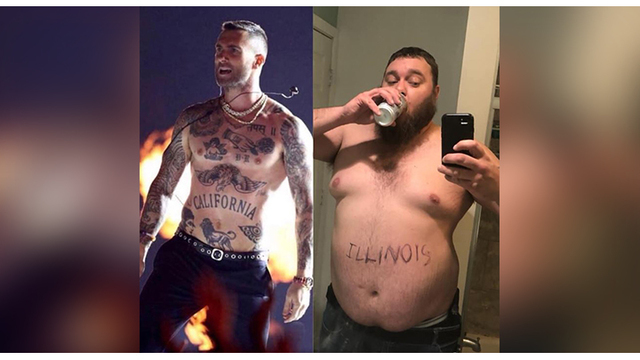 KANKAKEE, Ill. (WTVO) -- Kankakee resident Kevin "Mitch" Mitchell and his chest went viral after the 28-year-old posed shirtless in his bathroom to compare his physique with that of Maroon 5 singer Adam Levine after Sunday's Super Bowl. Levine took off his shirt during Maroon 5's halftime performance, which showed off his "California" tattoo on his stomach. Mitchell went into his bathroom and wrote "Illinois" on his stomach and posted the photo to Facebook. Mitchell told the Kankakee Daily Journal that writing "Illinois" backwards on himself was difficult, but it may have been worth it as the post racked up 42,000 shares as of Tuesday.